"Soda Blast Paint Removal Edinburgh Glasgow Scotland"
SodaBlasting is an amazing technology that can be used to remove paint from virtually any surface without causing any damage. Unlike other blast cleaning products like sand blasting soda is a soft medium so can clean items without complete disassembly - safe for rubber and glass so the cleaning and restoring engines, wheels, motorcycle frames, car parts, bodies and framework is simple and cost effective. 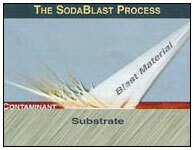 SODA BLASTING removes virtually any surfaces coating or contaminate from almost any material without caustic chemicals, damaging solvents, heat, or toxic or explosive fumes making Soda Blasting safe for a great deal of applications.